Jessica Rossi may only be 24 but she has already established herself as one of the world’s finest trap shooters in circulation. Since making her professional bow in 2009, the Fiamme D’Oro competitor can boast of a London 2012 Olympics gold medal, World and European titles and a World Cup Finals victory. The array of honours is impressive but still does not diminish Rossi’s hunger for silverware. In fact, she has already set her sights on retaining her Olympic crown in Rio this summer. Earlier this month, Rossi was at the Bidnija ranges along with the Italian national team for the Malta International Grand Prix. “This is my first time here in Malta and I must admit that I never expected such a warm reception,” Rossi told The Sunday Times of Malta. “The people here made us feel very welcome right from day one and we were provided with all that we needed to conduct some good training sessions. The Bidnija ranges are situated in a very beautiful area and the place is very up to standard. Rossi rose to stardom in London 2012 when she produced an almost flawless performance in the Trap competition, amassing a world and Olympic record score of 99 from 100 to secure gold. “The 2012 Olympic Games were truly a memorable experience,” Rossi said. “I knew that I could challenge for a place on the podium. Before my trip to London I had already won European and World Cup titles and that inevitably increased my confidence that I could return home with a medal. “But to win the trap competition with a record score was extraordinary, unbelievable. But what effect did that London result leave on Rossi? “Nothing particular, really,” she said. “Since I started practising the sport I always approached one competition at a time so once the London Games were over my focus quickly shifted to the next event. Obviously, there was more media attention after London but I made sure it did not affect my performances. This season, Rossi is enjoying another strong run after winning gold in the Qatar World Cup shoot which secured her place in Rio. Rossi said: “I know that there is a lot expectation on me being the defending champion but I’m treating the Olympic Games as just another competition. “My goal is to reach peak form in time for Rio and so far things have gone well. Having already won an Olympic shoot is a great starting point as now I know what to expect in Rio. 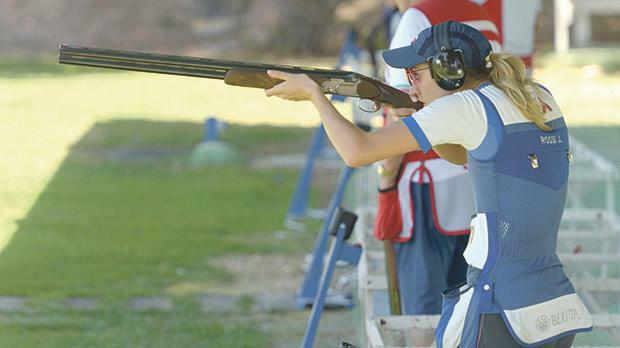 It’s not a common practice for women to be attracted to shooting competitions but Rossi’s love for the sport started since she was a young girl. “Normally young girls are more likely to try swimming, ballet or gymnastics first but not shooting,” Rossi smiled. The build-up to the Rio Games has been dominated by the huge concern following the outbreak of the Zika virus. Rossi admitted that it’s only natural to be concerned but reckons the virus will not be her only worry during her time in Brazil. “Unfortunately, there is great concern among female athletes, in particular, about the dangers of contracting the Zika virus,” Rossi said. “Our National Olympic Committee is providing us with details and procedures to follow, so, we should be okay. “However, my other major concern is more about safety. In April, I took part in a pre-Olympic competition in Brazil and, unfortunately, I had a very frightening experience. “We were caught in a shooting incident and, surely, that was an episode in my life which I like to forget quickly. Rossi also had a word of encouragement for women shooters. “If there are girls out there who are interested in our sport they should come to the range and try it out,” Rossi appealed. “Shooting is held in the countryside and the chances of getting hurt are far less than other sport. True, you are using shotguns here but the weapons are nothing more than an instrument to be used solely at the ranges.